It might take you a moment to find the storefront. And once you spot the sign and wander towards what you think is the front door, you’ll be tempted to snag a seat at the patio, hidden in plain sight. But continue through the black-on-black front doors and you’ll be transported to a scene far removed from the warehouse district just north of Montgomery Plaza. 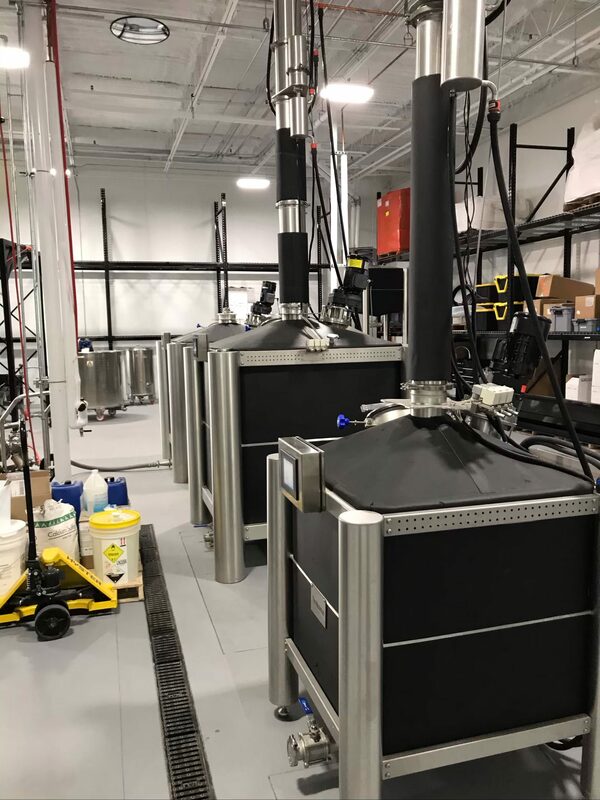 Blackland Distillery is the latest craft distillery on the scene in North Texas, owned by Markus Kypreos who is churning out four distinct liquors in the initial release: vodka, gin, bourbon, and rye. But we’ll get to the spirits. First let’s talk about the bar. Part speakeasy, part upscale cocktail lounge, the room is classy but not pretentious. A U-shaped bar top is surrounded by comfortable booths. 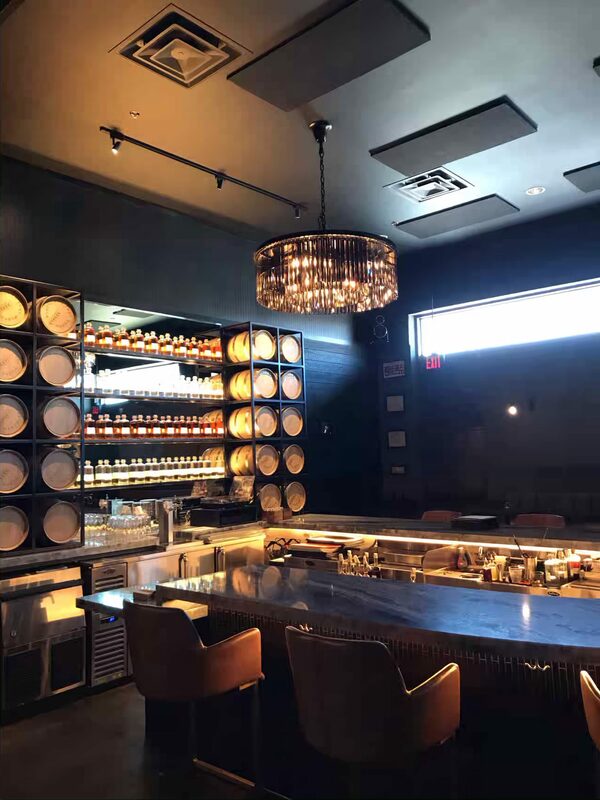 Chandeliers hang overhead while a mirrored back bar displays Blackland’s proprietary liquor in elegant decanter-style bottles. 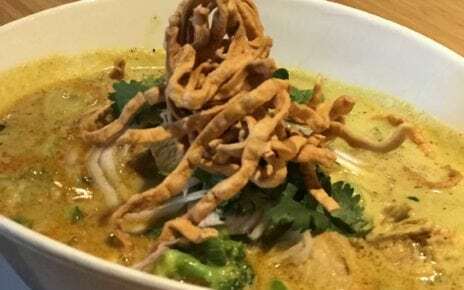 If you couldn’t tell from the fact that there are no TVs on the walls, one glance at the menu reveals that this isn’t your typical West 7th joint. The cocktail list, created by bar manager Jeremy Olivier, showcases creative concoctions and features house-made liqueurs alongside Blackland’s spirits. 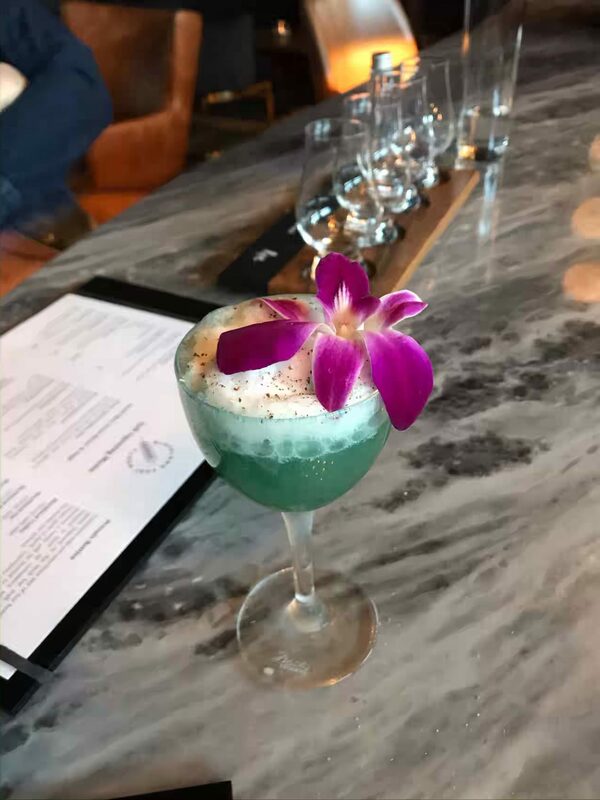 One standout is the Polynesian ’75, a beautiful blue combination of gin, lime juice, coconut flakes (toasted and untoasted), and champagne acid. On the other end of the spectrum, the Blackland Old Fashioned certainly won’t disappoint whiskey drinkers. Staying on top of national trends, the bar will feature cocktails such as the Polynesian ’75 on nitro and the Old Fashioned on tap. Of course, the stars of the show are Blackland’s spirits, made in the back of the house. With a focus on achieving purity through high-tech processes, Blackland is experimental yet refined. Computerized stills of various sizes take the guessing game out of the picture by perfectly managing temperatures at each stage, percentages of tail vs. head vs. ethanol, and much more. Water filters abound, and freshly filled new oak barrels hold promise for the future. Markus and his team are clearly having fun refining their style and flavors. On our visit, we were impressed by the cleanliness and purity of the vodka. After passing back and forth through dozens of filters, it tastes remarkably smooth and crisp. Next up was the gin. I have to preface this by saying that I am not a gin drinker, but there was something about the citrus-forward spirit made with 12 different aromatics (including the very interesting galangal) that kept me wanting more. 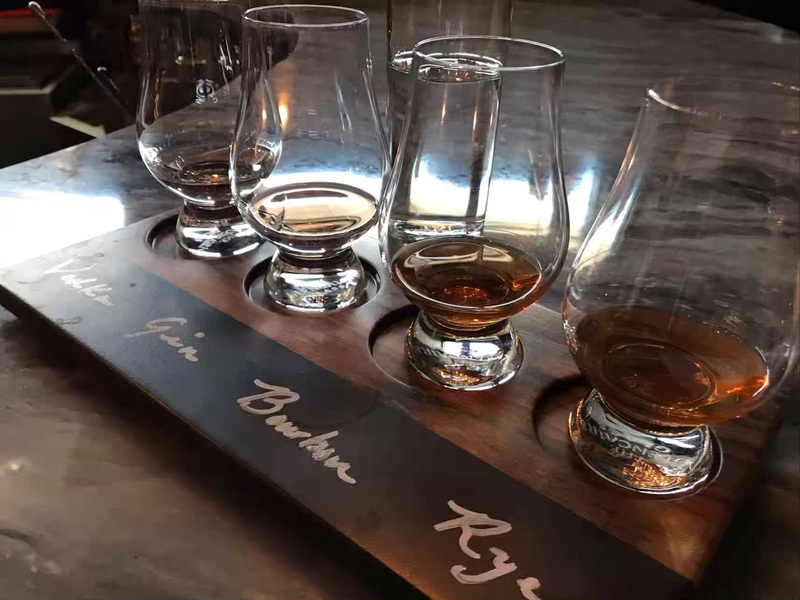 For the whiskeys, Blackland uses blends featuring locally sourced grains including triticale. Both the rye and bourbon hold up on their own or in cocktails, though I was partial to the spice and dryness of the rye. 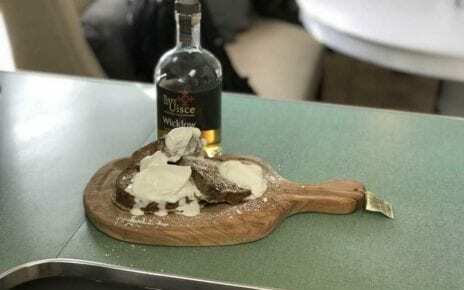 It’s growing increasingly difficult to stand out in the local whiskey market, but Blackland’s commitment to using local grains – fresh from the Texas Blackland Prairies – will serve them well. 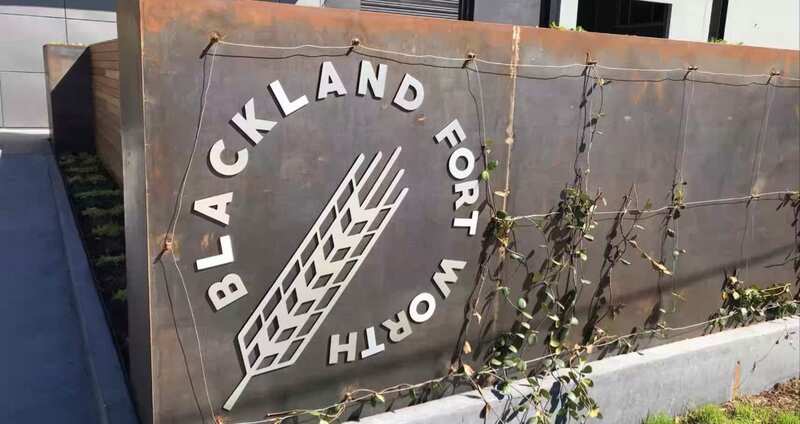 Blackland Distillery will open on March 20 to the public with bottles of vodka, gin, bourbon, and rye available for purchase. We look forward to having both a new bar and distillery to enjoy and support. 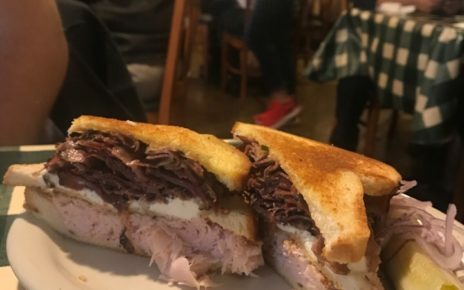 In an area of town dominated by sports bars and drunken college students, it’s an ambitious and welcome endeavor. Blackland Distillery is ready for Fort Worth. Is Fort Worth ready for it?